The track crew, Ray Cannon and Ed Amrhein, is shown cleaning and adjusting a girder rail switch at 28th street. The long item at the top of the picture is the movable point of the switch. The rail in the lower portion of the picture holds the movable point, which is help in by the two piece wedge lying across the rail. The large box to the bottom of the rail allows access to the wedge in its normal position. 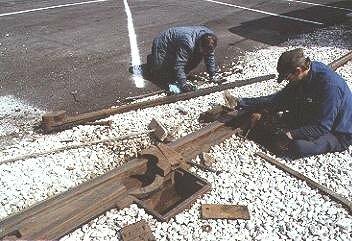 The track crew, one we can't identify and Carl Hosler, tamping ballast under a tie on the main line. 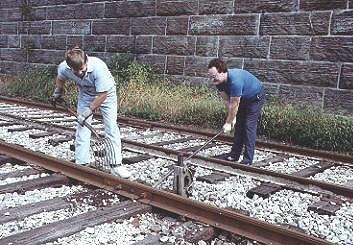 The silver jack holds the track up to the proper height, while the one trackman uses a bar to hold the tie up against the rail while the second trackman tamps the ballast under the tie. The ties and ballast are used to distribute the weight of the car to the earth below.